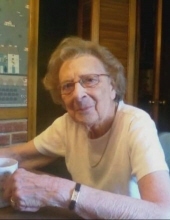 Rose Anastasio, 92 of Shepherd, TX passed away on March 19, 2019. She was born in New Haven, Connecticut on April 8, 1926 to Jerry and Filomena Mastrangelo. Preceded in death by her beloved husband Frederick, sisters Eleanor Mastrangelo, Mary Ciaburri, Laura DeFelice. Rose is survived by a son Fred Anastasio and wife Fiona, a daughter Maria Richard and husband Robert; grandchildren Kristen Williams and husband Jeffery and Theresa Self and husband Christopher Trahan; great grandchildren Peyton Ashley Williams, Jeffery Aaron Williams, Katelynn Elizabeth Trahan, Brodie Mitchell Trahan; a sister Gloria LaTorraca and numerous nephews and nieces. To send flowers or a remembrance gift to the family of ROSE ANASTASIO, please visit our Tribute Store. "Email Address" would like to share the life celebration of ROSE ANASTASIO. Click on the "link" to go to share a favorite memory or leave a condolence message for the family.